TADA! Yeah, I'm a flippin poet, and you didn't even know it. Sir Alfred Lloyd Dude, esquire. The problem I find with roof racks, while SUPER stable and handy, is the fact I end up on a highway, at night, headed for an event. Therein, my headlights attract every insect in the northern hemisphere to hurtle toward the front of my car, only to die a dramatic death and ending up smeared against my windshield, headlights, front bumper, roof rack air-deflector, bicycle bar tape, front bag, and... headlight. Specifically for the last situation, while the headlights of today are capped with super-tough Lexan lenses, if not glass, it's a pain to arrive at a ride and feel the need to wipe all this bugsnot off the front of one's bike... especially the headlight, which may reduce the amount of light reaching the road. Again, please... this is for the OCD. Whether or not a reduction of lumens occurs here is immaterial: it's just messy. We want things CLEAN. Ultimately, headlights (battery or otherwise) aren't cheap.. if the bug becomes a rock, well, that could get expensive quickly. Again, the postage-stamp analogy applies... but, it could happen. 1 beverage koozie. Mine is the soft, foldy kind - but the thicker molded foam would also work here. 1 spare reflective ankle band. I used a RUSA band that'd lost it's brother. Anything with Velcro fasteners will work. 4 x 4" wire ties. Something with which to poke a small hole through stuff: and old spoke, pair of scissors, awl. 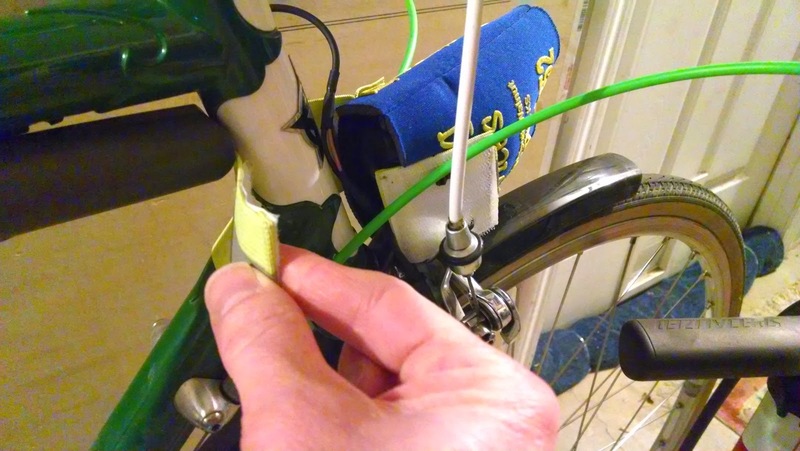 You will want to dry-fit first, but, your objective is to place the koozie over the front of your headlight, and try to determine how much ankle strap is needed to secure it LIGHTLY to the bicycle or rack adjacent or behind it. 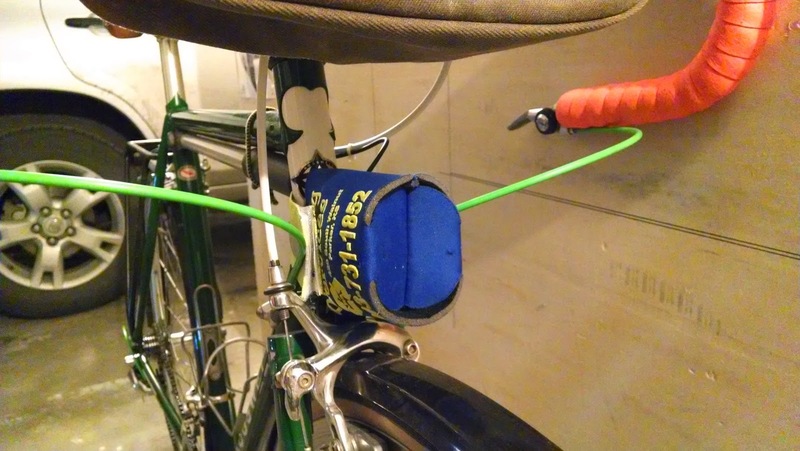 You don't want to apply pressure to the headlamp itself - the strap is only to keep the koozie from flying off. Wind-pressure alone should keep it in place while at speed. Once the correct length is determined (I just guessed), cut the ankle band in two, leaving each end of the hook-n-loop fastener separate - one for the left, one for the right. 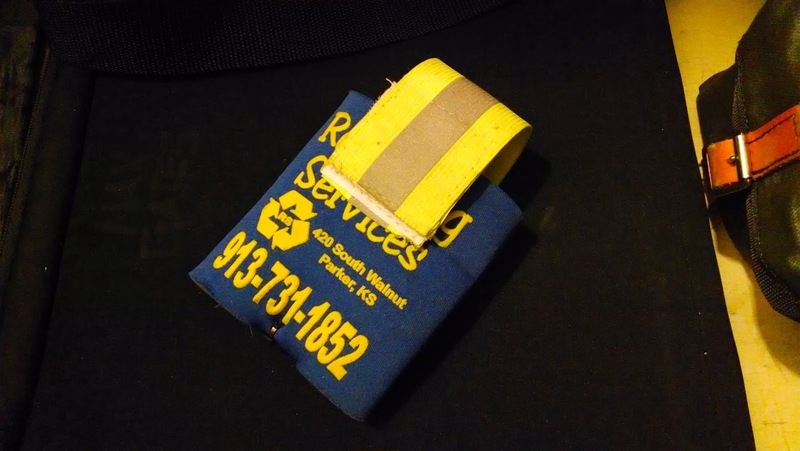 On each side of the koozie along the upper edge, along with one or the other ankle strap half, poke a two holes - a total of four - through which the wire ties will feed inside, then back out of the strap, the koozie, and back (see photo 2), then fasten the wire ties to complete the attachment. Repeat on the other side of the koozie, 180-degrees, directly across the diameter of the koozie, with the other half of the ankle band. 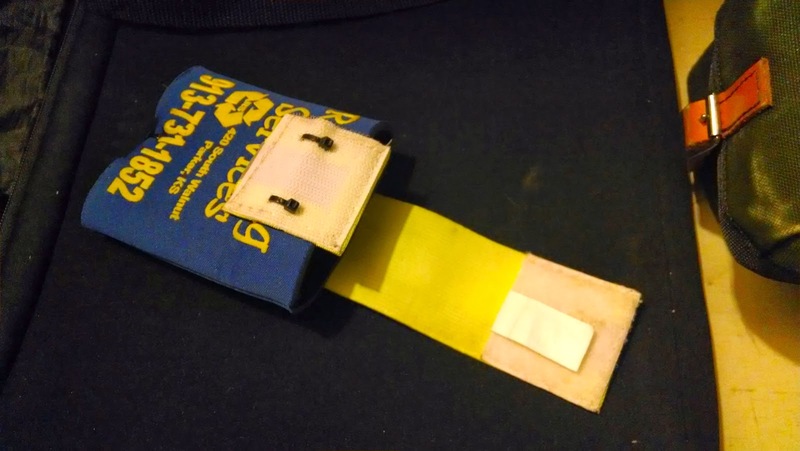 The result will look like the photos below, the koozie now has an upper "handle" created by the ankle band, like a tiny bag. As mentioned above, this is now a multi-tasker... with a 12 oz. can inserted, now you are prepared for extremely rough fishing, without fear of your drink being ejected from your koozie. Riiiiight. This is a real problem - ask any weekend fisherman, or quad-bike driver. The reflective trim also allows one to find their drink in the dark, during all-night scouting missions in the Peruvian jungle. The finished product looks like a tiny, up-cycled, wrist-mounted messenger bag for things like fortune cookies or county-fair funnel-cake remnants. More detail is revealed with the strap 'halves' un-done. One side pretty much just involves the 'hook' portion of the hook-n-loop fastener, the other with the 'loop' section, and a long section of the strap. Your generator headlight may vary... and models like the taller Lumotec 'Fly' models may present issues with koozie fit, but you get the idea. This is your headlight; exposed, naked, just waiting to be obliterated by a small meteorite or falling boulder. Highway pebbles are a problem, too. If you subscribe to the following scenario, wherein the odds of something happening are 1,000,000,000:1, and therefore, it *will* happen to you on your next car trip, then you need this product. 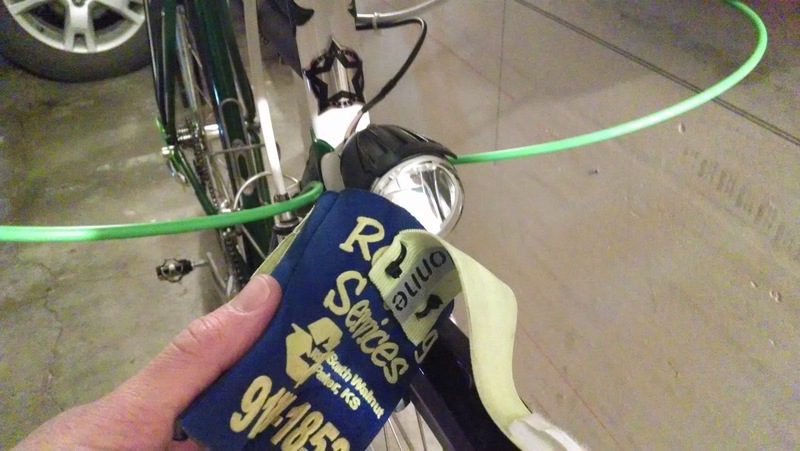 If you drive to each ride in the dark at 100+ MPH through your local rain-forest, then you don't have time to debug the entire front surface of your bicycle - but, with the headlight koozie, you won't have to. If you live where I do, then basically each summer drive is sorta like trying to drive through that hole where the release handle lives for the trap Indiana Jones and Short-Round accidentally trigger in "Temple of Doom." Make one of these now, or your life is meaningless. Like Barry White on the weekends, the headlight koozie approaches the headlight all warm and fuzzy-like, complete with soulful music and the gentle hum of a fog machine. Soon, your headlight will be immersed in a cloud of pure ecstasy. 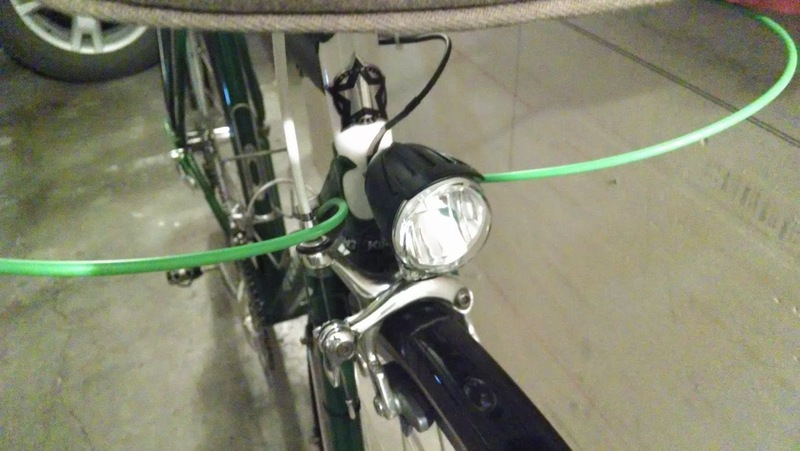 With the headlight now protected, the strap (in this particular fork-crown mounted set-up) feeds behind the bicycle headtube to rejoin the other end of the hook-n-loop fastener for a secure fit. 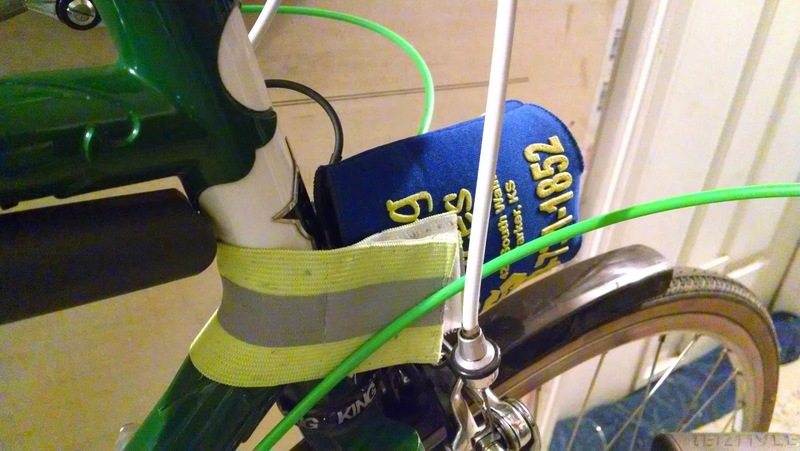 Remember, it needn't be tight - don't add any stress or pressure to the light or its wires... though doubtful it would really damage anything, the idea here is simply to keep the koozie from flying off at highways speeds, or while stopped. Affixed and cozy, your headlight is now ready for that cross-state drive to the next rando-ride. A front view, now anything you encounter on the road to rando will hit the koozie, and not your headlight. Just remember to remove before riding. If not, you'll probably figure it out pretty quick. Multi-tasks during the post-ride festivities, with the kind of safe and reflective style which only a seasoned randonneur can impart. Cheers, mate! Now that your headlight is protected, it's time to get all up in that 300k. Bet. No more! Enter the PVC wheel-chock 4000! But, dude, how do I get one of these amazing things?? You don't get it, you build it! Any remnant length of 2.5 or 3" PVC pipe, at least 6" long for best results. A length of 2" nylon "backpack" strap. Most better hardware stores sell it by the foot - mine came from some random shoulder strap for some random bag I didn't use. All such things go into "the pile"... which is really an OCD-friendly collection of shoe boxes and Boulevard beer boxes, labeled according to its contents: Bag parts, tubes, stickers, fava-beans, Chianti. You know. "Parts." Knob Noster goes to eleven!